Laura Ashley Doll House - Decorative Play, Design it Your Way! A delightful 4 room doll house in Laura Ashley decor. Comes with a Kitchen, Living Room, Master Bedroom, and Teen Room. Have fun changing the wallpaper and fabrics. Lights and sounds in every room. Comes fully furnished with loads of accessories. 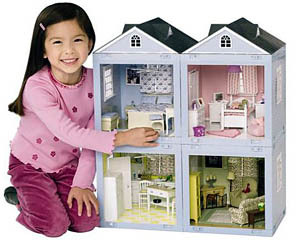 With the Laura Ashley dollhouse, children can be the designer of their very own dream dollhouse. The dollhouse includes a master bedroom, kid's bedroom, living room, and kitchen, and every room can either stand as a single unit or snap together with the other rooms to create various home styles, including a single-level ranch-style or two-story colonial-style home. Measuring 10 inches by 10 inches, each room comes with removable wall panels in a variety of colors and styles, including solid colors, stripes, floral prints, and geometric patterns that you can swap out to create a whole new look every time you play. All of the furnishings, fixtures, and fabrics are based on the romantic floral designs of the British designer Laura Ashley. Accessories include rugs, bedspreads, quilts, and pillows, along with miniature cutlery in the kitchen drawers and tiny ice cubes in the drinking glasses. To add a touch of realism, all rooms feature either working lights and/or sound effects, including an alarm clock radio, television, or the crackling sounds of a fireplace. Each room requires three AA batteries for operation, and you can expand the dollhouse by purchasing additional rooms.